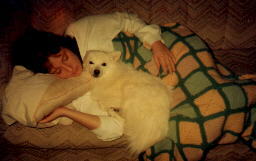 Schenker came into our lives in February of 1984. He had spent a couple of months in the local pet store in a tiny cage and was pretty traumatized by that experience. He is the sweetest, most loyal dog imaginable and for the last 16 years he's blessed our lives a hundred times over. DiDi came by way of a rescue that we did. I saw an eskie running down my street and thought that somehow Schenker had gotten loose. So I chased the dog down only to realized the he wasn't Schenker and that he had obviously been on the streets for some time. I called all the local veterinarians, shelters and ran an ad in the paper to no avail. I finally found out about a wonderful lady, Mary Jane Stockdale, so I called her and she told me that she had a lost report on an eskie but that it was very old. It was the only lead we had so I called the number. The people lived in New Jersey and had lost the dog while visiting a friend at Ohio State University as they traveled across the country. When I called and spoke with the owner Jackie, she told me that the dogs name was Spooky. As I was telling my husband Dale this poor dog heard his name started to wiggle and bark. I told her "I think we found your Spooky!" She sent me a picture and sure enough it was him. He had been running the streets and eating out of garbage cans for 4 months so his health was pretty bad. On top of that he had a herniated bowel and would require surgery. We spent the next 3 weeks getting him healthy enough to fly home (and falling in love with him). Finally he was ready to go back to Jackie, so we put him on the plane and kissed him good-bye. I got a call a few hours later that he had arrived safely and was scheduled for surgery in 1 week. I had cried a bucket of tears over him but I knew he was finally home and safe. Unfortunately a week later his owner called and told me that Spooky didn't make it through surgery. She was crying and I was crying and the whole conversation was pretty sad. She told me how much she appreciated everything we had done for Spooky and I told her what a great dog he was. Then she said that when Spooky got home his mate was in heat and she thought that they may have mated. She wouldn't know for a couple of weeks and didn't want to get her hopes up. A couple of months later the phone rang. Jackie was calling to tell me that Spooky's did manage to have a litter with his mate, 2 little girls. She told me she would like for us to have one after all love and care I'd shown him. She said she thought Spooky would have wanted it that way...... Our little DiDi arrived the next day. She reminds me a lot of her dad but mostly she reminds me of the love some owners have for their pets and the gift a stray dog can sometimes bear. If you have a special animal in your life, and would like to tell me about them, I'd love to hear from you. This is Schenker and his best friend Frisbee. We found this guy a couple of years ago. They play together, sleep together, and generally turn the house upside down whenever possible. Click here to see JACKSON my potbellied pig!